I know, I know, it’s been a while. I’ve missed you too. It’s nothing personal (that’s what they all say), but it’s true. I’ve been working on my doctoral dissertation and am up to my eyebrows in neuroscience research. Anyway, the world keeps spinning and I need to post, so I thought I’d come up for air and put up some ideas on the topic of positive discipline. Positive discipline is a parenting philosophy that’s been around since the 70’s and has lots to offer. There are many books on the topic, with the one by Jane Nelson, titled Positive Discipline being the most popular. There are many variations on this parenting method, but the core philosophy remains consistent throughout most of them. I’ve highlighted some of the main ideas for you below. There are no bad kids; there are only difficult behaviors. Children struggle due to many factors including: not-yet-complete brain development, which leads to impaired judgment and limited self control, emotional factors such as anger and jealousy, strong temperament traits, learning challenges, etc. Adults need to work to build a respectful, supportive relationship with their child that creates a desire for cooperation (vs. punishment-based parenting). There is a strong focus on prevention i.e. what you can do to keep negative behavior from happening. Things like clear rules and expectations, fair warning about consequences, consistent parent response, and discussions with your child about ways to solve behavior problems—are all key. Parents are encouraged to model self-control. This means that we stay out of the child’s emotional turmoil and provide rational, helpful guidance. There is a focus on building skills for self-management vs. simply punishing your child. There is an emphasis on positive reinforcement i.e. verbal praise and acknowledging effort. The idea here is that kids will be more motivated to correct behavior by encouragement than punitive or harsh reactions. Parents do address difficult behaviors, but in a constructive and non-reactive way. Positive discipline does not mean that you don’t stop your child, give consequences or reject certain behaviors. You can–but in a way that maintains a cooperative, constructive tone. Positive discipline balances authority (guidance and limits) with empathy (tuning into your child’s feelings and experience). * Practice both the attitude and skill of acceptance. Having an accepting attitude means understanding that your child has a unique set of strengths and weaknesses, and that (their weaknesses especially) need patience, tolerance and guidance. Practicing the skill of acceptance means that you first understand what parts of your child you can and can’t change. Then you decide to accept and tolerate those parts you can’t change while going to work on the areas that have the best chance of growth. * Work to create positive tone with your child. Find things to like and appreciate about your child and notice these things out loud—especially if you’ve been in a pattern of struggle with them. Howard Glasser’s book Transforming the Difficult Child advises parents to appreciate even the smallest positive qualities and efforts from the child. * Model respect for your child by not using physical punishment, yelling, belittling/teasing, shaming or excessive guilt to correct behavior (a dose of natural guilt is okay). * Try to stay as neutral as possible when correcting your child. If you start to lose your cool, let them know in a calm way that you’re getting frustrated. If things don’t improve, model interrupting escalation (an important skill) by disengaging until you calm down. * Help your child work on the core skills that prevent most negative behaviors from happening in the first place. They are: Understanding Feelings, Communication, Flexibility, Respect and Problem Solving. See my book Better Behavior for full explanation of how to work on the core skills. * Understand your child’s temperament. Main traits include: Sensitivity, Intensity, Persistence, Adaptability, Impulse Control, Focus and Activity Level. Identify which traits are contributing to your child’s difficult behavior. * Identify which behaviors are coming from temperament and which from intentional choice. Be careful not to accuse your child of negative intent when temperament traits are causing the behavior, as this erodes trust and self-esteem. Adjust your expectations if you know your child struggles with strong temperament traits i.e. low focus, high reactivity etc. Remember, temperament is not an excuse but it is an explanation. * Use lots of positive reinforcement i.e. catch them doing it right. Also communicate your confidence in their good behavior and good judgment. Give unexpected praise and rewards—intermittent reinforcement is the strongest kind. * Make your expectations clear. Post and discuss rules for behavior. Have kids be part of making the rules—this makes them more invested in following them. * Redirect your child when possible. Take the focus off ‘no’ and ‘don’t’ and instead give him or her something else they can do. Remember, ‘no’ alerts them to a problem but it doesn’t teach new skills or steer them to alternate choices. * Try to understand the purpose of the behavior i.e. what the child is trying to communicate to you. Are they tired, over-stimulated, angry or anxious? * Help your child learn to express the feelings that are underneath their behaviors. Validate your understanding of their thoughts and feelings. Validation creates cooperation. * Learn to anticipate which situations are most difficult for your child to handle. Then Preview, or make a plan for good choices before you enter that situation. * Give fair warning for consequences. Surprise fuels reactivity. * Present consequences in a consistent yet fair manner, without excessive negotiation. This helps kids respect your authority and understand that you mean business with your limits. Only flex if they present you relevant information about the situation that affects your decision. * Use reward charts or systems to increase structure and keep your child focused on problem behaviors. Use strong motivators (incentives or consequences) as currency. Remember when…? Help your child recall the situation. What were you feeling? Validate, or let them know you understand their feelings. What did you do with that feeling? (i.e. hit, scream, run away, etc.). Was that the best way to express that feeling? (Help them self-evaluate). How could you express that feeling in a better way? (e.g. tell the person how you feel, take a break & count to 10, walk away, get help from an adult, etc.). This is the alternate skill. What will you do next time? Have the child plan for the emotional/behavioral choices they will make next time they are in this kind of situation. Repair (Have your child apologize, make amends etc., if necessary). This includes forgiving self and deciding to move on. Discuss consequences. (Make sure to reduce consequences if your child has put good effort into participating in the Review). Okay, back to my studies. Hope this was helpful! 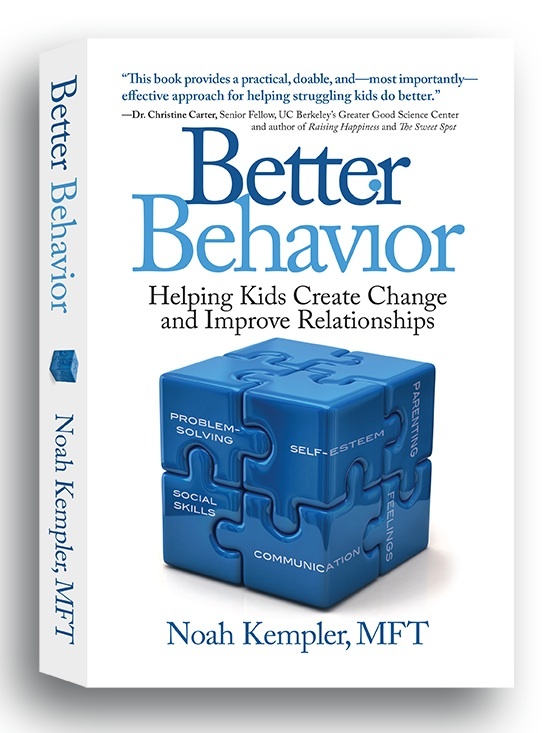 Better Behavior: Helping Kids Create Change and Improve Relationships. Available in both print and eBook at: Amazon, Kindle, Barnes & Noble, iBooks, Nook, and Kobo. If you know someone who might like to receive these parenting articles, please forward this article and they can sign up for the email list here. Information in this article is for educational and informational purposes only and does not constitute professional advice for any specific medical or psychological condition. This entry was posted in parenting by Noah. Bookmark the permalink.